Psalm singing has been a part of the Christian church from its beginnings. Psalm 23, a particularly beloved psalm, appears often as the psalm of the day in the Revised Common Lectionary, especially on the fourth Sunday of Easter. It is an integral part of services of death and resurrection. Psalm 23 is one of the few psalms that many of us have committed to memory. Calvin enlisted poets Clément Marot (1496-1544) and Théodore de Bèze (1519-1605) to compose the texts of the 150 metrical psalms to a variety of meters. The idea was to put the psalter in a strict poetic form so that nothing was added or deleted from the original biblical meaning—a difficult task and one that often produced awkward poetic results. This manner of proceeding seemed specially good to us, that children, who beforehand have practised some modest church song, sing in a loud distinct voice, the people listening with all attention and following heartily what is sung with the mouth, till all become accustomed to sing communally (Calvin, 1537). Astute readers will recognize some elements of this statement in common with John Wesley’s famous “Directions for Singing” found in Select Hymns with Tunes Annext, 1761 (see https://www.umcdiscipleship.org/resources/wesleys-directions-for-singing). As Calvin’s influence spread throughout Europe, the need for psalters (collections of metrical psalms for singing) in other languages (especially Dutch and English) beyond the French spoken in Geneva arose. Many psalters were composed in English. Among those was the Scottish Psalter in1650, the date which the General Assembly of the Church of Scotland approved the texts for use in the church. 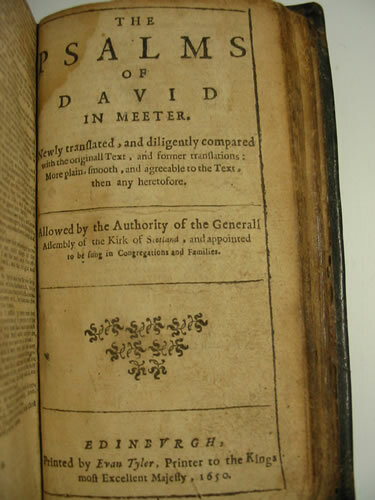 The full title of the psalter is, in the spirit of the time, rather formidable by today’s standards: The Psalms of David in Meeter. Newly tranflated, and diligently compared with the originall Text, and former tranflations: More plain, fmooth, and agreeable to the Text, then any heretofore. Allowed by the Authority of the Generall Affembly of the Kirk of Scotland, and appointed to be fung in Congregations and Families Edinburgh, Printed by Evan Tyler, Printer to the Kings moft Excellent Majefty, 1650. An earlier Scottish Psalter (1564), followed by at least six editions, had been extensively used. This psalter was not of the poetic stature of the 1650 edition that followed almost a century later due to the authority of King James VI of Scotland (King James 1 of England), for whom the King James Version of the Bible (1611) is named. Several attempts to modify the Scottish Psalter in the early seventeenth century were not approved by King James, who, according to the editors of the Canterbury Dictionary of Hymnology, “thought well of his own poetic skill and was ambitious to be known as a second King David in the matter of psalmody. Six years after his death , his version, The Psalmes of King David translated by King James, was published at Oxford in 1631” (“Scottish Psalter”). Francis Rous (1580/81-1659), a child prodigy born into a noble Cornish family and educated at Broadgates Hall, Oxford (BA 1597), completed the original texts for this psalter around 1644. He was a politician with strong leanings toward Puritans and against those who appeared to participate in any “popish” practices. He published The Booke of Palmes in English Meeter (1638) in Rotterdam anonymously with a second edition appearing in London (1641) in his own name. Unusual by today’s legislative practice, the House of Commons approved Rous’s version in 1643 “for general use”! 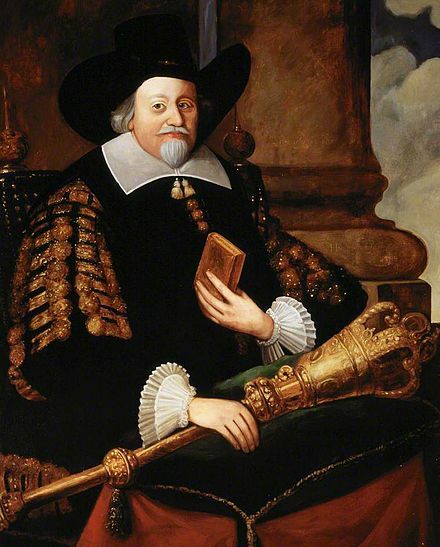 However, the House of Lords chose another version by William Barton (1597/98-1678), and, in the competition between the two psalters, the psalter by Rous was not as successful because it did not have the support of the higher House of Lords. “The Lord’s My Shepherd” is perhaps the most widely sung version of Psalm 23 coming from this era and the most continuously sung metrical psalm from the Scottish Psalter. It was common for writers to borrow freely from previous versions of a psalm and specific biblical translations—a poetic technique referred to as imitation. Miller Patrick, one of the foremost scholars of the Scottish psalter tradition, has traced specific lines and phrases from “The Lord’s My Shepherd” to seven earlier psalters, the earliest of which was the “Old Version” of 1564 (Young, 1993, 640). A complete comparison of the Scripture with the stanzas of the metrical psalm will reveal how closely the two are correlated. Many tunes have been used with this common meter (8.6.8.6) text, but none as enduring as CRIMOND. According to Carlton Young, it became popular in the 1930s and 1940s through broadcasts of the Glasgow Orpheus Choir (Young, 1993, 640). Composed by Jesse Seymour Irvine (1836-1887), the tune was named by the minister’s daughter for a village near Peterhead, Grampian, Scotland. Once again, the editors of the Canterbury Dictionary of Hymnology place the significance of metrical psalm singing in the context of faith formation: “The metrical psalter was of immense importance in furthering and establishing the Reformation in Scotland” (“Scottish Psalter”). Calvin, John. “Articles Concerning the Organization of the Church and of Worship at Geneva Proposed by the Ministers of the Council (1537).” In Calvin: Theological Treatises, translated and edited by J.K.S. Reid, 47-55. Library of Christian Classics 22. Louisville, KY: Westminster John Knox Press, 2006. Quoted in Ezra Lincoln Plank, “Creating Perfect Families: French Reformed Churches and Family Formation, 1559-1685.” PhD (Doctor of Philosophy) thesis, University of Iowa, 2013. http://ir.uiowa.edu/etd/1727. [Editors] Nicholas Temperley, "Scottish Psalter." The Canterbury Dictionary of Hymnology. Canterbury Press, accessed November 8, 2017, http://www.hymnology.co.uk/s/scottish-psalter. Leslie, John, "Francis Rous." The Canterbury Dictionary of Hymnology. Canterbury Press, accessed November 8, 2017, http://www.hymnology.co.uk/f/francis-rous. Patrick, Millar. Four Centuries of Scottish Psalmody. London: Oxford University Press, 1949. Nicolson, Adam. God’s Secretaries: The Making of the King James Bible. New York: HarperCollins Publishers, 2005. Watson, J. R. "The Lord’s My Shepherd, I’ll Not Want." The Canterbury Dictionary of Hymnology. Canterbury Press, accessed November 8, 2017, http://www.hymnology.co.uk/t/the-lord’s-my-shepherd,-i’ll-not-want. Young, Carlton R. Companion to The United Methodist Hymnal. Nashville: Abingdon Press, 1993. C. Michael Hawn is the University Distinguished Professor Emeritus of Church Music and Adjunct Professor and Director, Doctor of Pastoral Music Program, for Perkins School of Theology at Southern Methodist University.